Who was Lieutenant Colonel John Douglas Dalley, Director of the Malayan Security Service (MSS), and what was the MSS? Dalley was a senior pre-war officer of the Malayan Police who became Commander of Dalforce (named after him), an irregular guerrilla force that fought bravely against the Japanese when they invaded Malaya/Singapore in 1941, and later became Director MSS. An account of Dalforce will be given later in this study. Dalley joined the Federated Malay States Police as a Cadet Assistant Superintendent of Police in November 1920 when he was twenty. That was the average age for Malayan/Singapore police gazetted officers to join the Malayan Police at that rank. After passing in due course the required Malayan Government examinations for gazetted police officers in police law, colonial regulations, Malayan Government regulations, weapon training and Malay language, Dalley was confirmed as an Assistant Superintendent of Police (ASP) in 1924. How did the Malayan Security Service come into existence? The pre-war Inspector General of the Straits Settlements Police, A.H. Dickinson, provided an official account of the genesis of the early MSS and how it was founded when he included it in a list of British pre-war intelligence organizations that he prepared after WWII for Lieutenant General Arthur Earnest Percival, the ill-fated commander of the Allied forces in Malaya and Singapore who surrendered Singapore to the Japanese on 15 February 1942. Percival was then writing his dispatches at the War Office on the Malayan Campaign.2 Dickinson reported that the MSS was created in September 1939 at the suggestion of MI5, the UK domestic intelligence agency, which then included British overseas colonies within its remit, with the support of the colonial Singapore and Malayan Governments, when it seemed likely that the separate Special Branches in Singapore and Kuala Lumpur would need restructuring and refining to prepare for the possibility of war with Japan. It was established on a pan- Malayan basis as a coordinating and reporting body for political and security intelligence. Its headquarters were at Robinson Road, Singapore, and it had a Malayan branch in Kuala Lumpur, with an MSS officer based in nearly all of the Malayan States and territories. As such, it formed part of what was referred to as the “Singapore Fortress Defence Scheme”, which had both military and civil sections. This book is the result of a conversation I had with the late Mr S.R. Nathan, the distinguished former President of Singapore, whom I had first known in Johor Baru where he was working for the Public Works Department (PWD) before he moved to Singapore and eventually became President of Singapore. I was then in the Johor Special Branch. Much later, when he moved to Singapore and became President, and I was no longer a Special Branch officer but had become a Visiting Senior Fellow at ISEAS – Yusof Ishak Institute, Singapore, we renewed our acquaintance and we used to meet sometimes, at his invitation, in his office at the Singapore Istana to discuss intelligence matters in which, having been at one time Director of the Security and Intelligence Division of the Singapore Ministry of Defence before he became President, he maintained a keen interest. He knew that I had written a book on the Malayan Special Branch, and he asked why I did not write a similar study about the Malayan Security Service (MSS), which was the domestic intelligence agency established by the British covering both Singapore and Malaya from its headquarters in Singapore when they returned to Singapore after the Japanese surrender in August 1945. When I said I was interested, he arranged for me to be allowed to use the digitized records of the MSS that were held by Singapore's ISD (Internal Security Department) in the ISD Heritage Centre, Onraet Road. 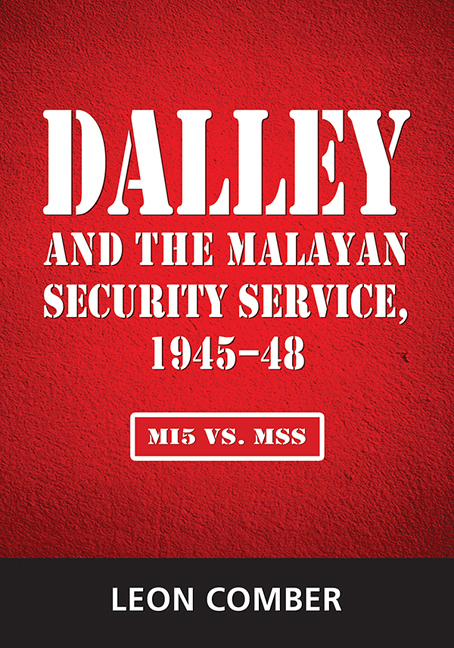 It was then I started my research on this book, Dalley and the Malayan Security Service, 1945–48: MI5 vs. MSS, although as I explained to Mr Nathan, I would perhaps sometimes have to rely on some of the background material I had used in my earlier paper “The Malayan Security Service (1945–1948)” and book Malaya's Secret Police 1945–60: The Role of the Special Branch in the Malayan Emergency, although I would incorporate in my present writing, wherever necessary, further information and insights which had come to light since then. In writing this study, full use has therefore been made of the fortnightly reports of the MSS's Political and Security Journal (PIJ) and its Supplements, complete runs of which have been digitized and held in the ISD, which I did not have access to when I wrote about the MSS so many years ago. This is the moment for which I have waited for many years — when I can see and talk to you again. The enemy we fought against has now been defeated but in the world, there are still many unseen forces that are causing unrest. We must continue, each and every one of us, to maintain peace and security in this country, and I am sure that as in the past, so in the future, you will do your best to attain this end. Many observers believed he was referring to the beginning of the Cold War (1945–90) and the rise of Communism after WWII as a result of the fundamentally different ideologies and interests between the Soviet Union and the West, which eventually spread to every part of the world. Thus, “Cold War”, as opposed to an “atomic hot war”, became a term used to indicate the struggle for the hearts and minds of the people between the competing political systems of Communism and Democracy. Essentially, in the Malayan archipelago and Indonesia in particular, this was emphasized to some extent by the power vacuum left by the sudden surrender of the Japanese at the end of WWII after the dropping of the two atomic bombs, but whether this is what Dalley had in mind when he spoke is unclear. The long PIJ Supplements that Dalley wrote after his return to Malaya on “Malay and Indonesian Communists” and the “Indonesian Situation and Malaya” attached to the MSS Political Intelligence Journals nos. 5 and 10, which will be referred to later in this study, nevertheless confirm Dalley's growing awareness of the problems which MSS would have to face in dealing with the post-war security situation, including the long-standing threat posed to Malaya's security by Indonesian left-wing parties stirring up trouble with Malay left-wing parties to rise up against British colonialism in Malaya as the Indonesians had done against the Dutch in Indonesia. This book fills an important gap in the history and intelligence canvas of Singapore and Malaya immediately after the surrender of the Japanese in August 1945. It deals with the establishment of the domestic intelligence service known as the Malayan Security Service (MSS), which was pan-Malayan covering both Singapore and Malaya, and the colourful and controversial career of Lieutenant Colonel John Dalley, the Commander of Dalforce in the WWII battle for Singapore and the post-war Director of MSS. It also documents the little-known rivalry between MI5 in London and MSS in Singapore, which led to the demise of the MSS and Dalley's retirement. Thus the MSS was wound up and separate Special Branches were once again established in Singapore and Kuala Lumpur reporting to their respective Commissioners of Police. However, to complete this account of Singapore and Malaya's domestic intelligence services, when Singapore merged a few years later with the Federation of Malaya on 16 September 1963 to become part of “Greater Malaysia” with Tunku Abdul Rahman as Prime Minister, the Singapore Special Branch soon realized that it now had to serve more than one master. It not only reported to its own Director and the Singapore Commissioner of Police but it was required to report as well to the Director, Special Branch, Kuala Lumpur, and the Inspector-General of the Royal Malaysian Police as part of Greater Malaysia. Who can ever forget Singapore's Prime Minister Lee Kuan Yew shedding tears on TV when he announced what amounted to Singapore's expulsion on 9 August 1965 from Greater Malaysia by Tunku Abdul Rahman, as Malaysia began to look less favourably on the effect that would be felt by absorbing the large predominantly Chinese population of Singapore on the overall ethnic balance of the new Greater Malaysia. But the Singapore Special Branch of what had by then become the independent Republic of Singapore, soon consolidated its position and looking ahead to 17 February 1966 the Singapore Government converted the Special Branch into the Internal Security Department (ISD) which assumed responsibility for the country's domestic political and security intelligence. It was separate from the Singapore Police Force although working closely with it whenever required. This has remained the case until today, although the title “Special Branch” has been retained in Malaysia, where it is still a division of the police. At the same time, the foundations of Singapore's external intelligence service were formed and the Security and Intelligence Division (SID) came into existence. In fact, many Singapore Special Branch officers in those early days hardly noticed the change and continued to think of themselves as “Special Branch”, but during the intervening years the ISD has established itself and become the formidable, impressive and much admired intelligence organization it is today. To revert to Dalley and the MSS, after he retired, Dalley's services were recognized on 8 July 1949 by the award of the King's Police Medal, which is undoubtedly a highly prestigious police decoration. The final details of the transfer of MSS officers and staff were decided at meetings held by the Commissioner of Police, Singapore, and the Colonial Secretary, Singapore, on 20 August 19481 and a meeting at the Singapore Special Branch on 25 August attended by A.J. Kellar, Head of SIFE; I.S. Wylie, Assistant Commissioner, Special Branch, Federation of Malaya; and N.G. Morris, Assistant Commissioner, Special Branch, Singapore, with E. Leighton, DSO (Defence Security Officer), Singapore and Federation of Malaya, in attendance. It was agreed that the finances of the two Special Branches should be operated separately from 1 October 1948, and on that date the balance of the MSS funds would become available to the Singapore and Federation of Malaya Governments, respectively. It was proposed that Woolnough, then based in Johor, should head the Malay and Indonesian Section, as shown above. The Assistant Commissioner would be made in charge of administration and be responsible for the collection and collation of all political information affecting the security of Singapore. He would also be expected to maintain close contact with other intelligence organizations in Malaya and neighbouring countries. The Superintendent would be employed mainly on Communist organizations and would coordinate and direct the activities of all sub-branches. In connection with Communist activities, he was required to pay frequent visits to the Federation of Malaya and contact officers there whom he might wish to consult. The General, Foreign and E & O Section would be employed on general enquiries, including affairs of Europeans, Eurasians, Siamese and foreign nationals not mentioned above, counterespionage, security of information in Singapore and surveillance. Interrogations connected with the “Emergency Regulations” (which were introduced after the outbreak of the Malayan Emergency) would be carried out by F.G. Minns, ASP, “but as he is already on the Singapore CID staff, there is no extra expense involved in this post”. In addition to J.E. Fairbairn, who held the rank of Local Security Officer, MSS, but was not a member of the Police Force, there was, too, J.H. Ellen, who was a direct appointment to the MSS and was not a member of the Police Force. Planning for the military administration of Malaya and Singapore after the Japanese Occupation (1942–45) had actually commenced in London from as early as 1943 by the War Office and the Colonial Office. It was during this period that the decision was made to re-establish post-WWII the pan-Malayan Security Service (MSS) that had existed for a brief period before the Japanese invasion of Malaya in December 1941, and the MSS accordingly returned to Singapore with the British Military Administration (BMA) in September 1945 and remained in place when the civil government returned in April 1946. There were difficulties in operating in the troubled and uncertain times that prevailed in Singapore and Malaya in those early days. Singapore was gripped with lawlessness and violence as soon as the Japanese army withdrew to its barracks, and the situation was not helped by the hiatus of several weeks which ensued before the reoccupying British forces landed in Singapore/ Malaya. During this period the Malayan Communist Party (MCP) and its jungle army, the Malayan People's Anti-Japanese Army (MPAJA), Chinese secret societies, and other armed gangs of civilians emerged to take the law into their own hands. It was a virtual “open house” for them in many ways as the rule of the gun prevailed, and first priority had to be given by the returning British colonial forces to restoring public confidence and combating the crime wave by putting police patrols on the streets supported by British troops. The delay was probably due to some extent to the unexpectedness of the Japanese surrender and the American General Douglas MacArthur in Tokyo requesting Admiral Lord Louis Mountbatten, the British Commander-in-Chief Southeast Asia, based in Kandy, Ceylon, to postpone accepting the surrender of the Japanese forces in Southeast Asia until the Japanese Government and its armed forces, under the authority of the Japanese Emperor, had signed the official surrender documents on the American battleship USS Missouri in Tokyo Bay. When the MSS landed in Singapore with the British Military Administration in 1945, the head of the MSS Singapore Division was Major J.C. Barry, and his counterpart in Kuala Lumpur was Lieutenant Colonel J.M. McLean. Both were pre-war Malayan Special Branch officers. It was undoubtedly a difficult time for any intelligence service. As related previously, Dalley was faced with a serious problem in focusing his attention on the intrusion of PKI elements and supporting left-wing Indonesian political parties into Malaya with the intention of subverting the MNP, Kaum Muda, and other leftwing Malay political parties to rise up against British colonial rule in Malaya, just as the Indonesians had done against the Dutch in Indonesia after the Japanese surrender in August 1945. Firstly, there was the proximity of Indonesia to Malaya, which was only a stone's throw away across the narrow Straits of Melaka. Medan in Sumatra is only an hour's flight from Penang in Malaya, and even in so-called “normal” times there had always been a considerable amount of illegal traffic, in junks and other small craft engaged in smuggling goods — as well as illegal immigrants — into Malaya from Indonesia, which was difficult to intercept. In those immediate post war days, immigration control on the west coast of Malaya facing Indonesia became increasingly difficult to impose.1 Many senior British immigration officers had been killed during the Japanese war or were medically boarded out after the war, and they had been replaced by less experienced Malay immigration officers who were not always adverse to their Muslim brothers being allowed to enter Malaya, especially as they spoke more or less the same language, followed the same religion, and looked the same, and not very much attention was given to whether they had valid immigration documents or not. It was probably not considered, anyway, they would create a problem by joining the large numbers of Indonesians who had already been living in Malaya for years. There was perhaps another more radical school of thought that Malaya should have declared independence from the British on 17 August 1945, just as the Indonesian nationalist leader Sukarno had done in proclaiming Indonesian independence from Dutch colonial rule at the time of the Japanese surrender, as it does not seem likely that the Japanese would have prevented them from doing so as they did not appear averse to leaving behind after their departure political problems for the returning Western colonial powers to settle. Before Dalley returned to Singapore from the UK in February 1947, considerable consternation was caused in Singapore by the receipt of a rather extraordinary telegram dated 2 September 1946 from the Colonial Office addressed to Malcolm MacDonald, then Governor-General for Southeast Asia, with copies to the local Singapore and Kuala Lumpur Governors. Seemingly without any further introduction, it forwarded a proposal by Sir Percy Sillitoe, Head of MI5, the UK domestic intelligence organization, whose remit extended to British colonies, to establish a branch to be known as “Security Intelligence Far East (SIFE)” in Singapore. It arrived literally out of the blue, as there had not been any prior notice of Sillitoe's proposal and, indeed, there is nothing in the records to indicate that the matter had been under consideration, although clearly it must have been discussed in the Colonial Office. It included an attachment dated 6 August 1946, some weeks before the date of the actual telegram, which was headed “Memorandum of Instruction”, covering the appointment of Lieutenant Colonel C.E. Dixon as Head of SIFE, as well as a “Charter” for SIFE indicating its proposed functions. The documents were, of course, first submitted in draft for approval here [presumably by MI5 to the Colonial Office], but as the Security Service [MI5] were most anxious to secure general approval with their provisions without delay, and in view of the fact that the relations of SIFE with Colonial Governments will generally be through Defence Security Officers whose duties are defined in a standard form of their own Memorandum of Instructions, it was in the circumstances agreed that general approval could be given without submitting the drafts to the Governors for comment. This certainly seemed to be, to say the least, a rather unusual method on the part of the Colonial Office to issue “instructions” to Singapore/Malaya, especially as Dalley had been available for consultation in the UK and the MSS in Singapore would be affected. As could be expected, the telegram caused some consternation in Singapore and the matter was considered at some length at several high-level meetings. When Dalley was confident that the serious threat posed by the MCP to overthrow British rule in Malaya, which he had long persisted in reporting, had at last been officially recognized and was being dealt with by the government, he turned his attention to another security problem that was beginning to emerge in the Malayan Peninsula. Indonesian left-wing elements were making determined efforts to induce Malay nationalist and left-wing political parties — many of them having maintained contact over time either directly or through the considerable number of Indonesians who had settled in Malaya — to rise up against British rule and resist the return of the British to Malaya, as the Indonesians had done to the Dutch in Indonesia. In fact, as Dalley well appreciated, if they had succeeded, it was quite possible the Malay nationalist and left-wing parties would join forces with the MCP to present a united Malay-Chinese front to fight against British colonial rule in Malaya, which would have placed the British in a much more difficult situation than they faced in fighting the MCP alone when the Malayan Emergency was declared in June 1948. The Japanese had virtually “given” independence to Indonesia in the confused period shortly before they surrendered, when Sukarno and Hatta declared independence on 17 August 1945, leading to the establishment of the Indonesian Republic under Sukarno as President. As rumours of the Japanese surrender filtered through to the people of Singapore/Malaya, Malay nationalists also intended to declare independence at the same time, and it is said that the Malay nationalist leader Mustapha Hussain wept bitterly as the Japanese surrender forestalled the declaration of independence for Malaya by just forty-eight hours, thus destroying the dream of a greater Malay nation. However, in Indonesia the political situation was soon overshadowed by the fighting that took place between the Indonesian Republican forces, who were impatient and determined to wrest independence for Indonesia from the returning Dutch colonial power by force rather than negotiation. Matters were further complicated by the arrival of a brigade of the 23rd British Indian Infantry Division, sent by the British from Singapore to assist in the evacuation of Dutch civilians who had been interned by the Japanese during the war.